When applying a new look and feel for ZK components, developers need to go through various steps from designing new style component images, cropping those images following ZK theme rule to preparing several CSS files in order to create and apply a new theme. 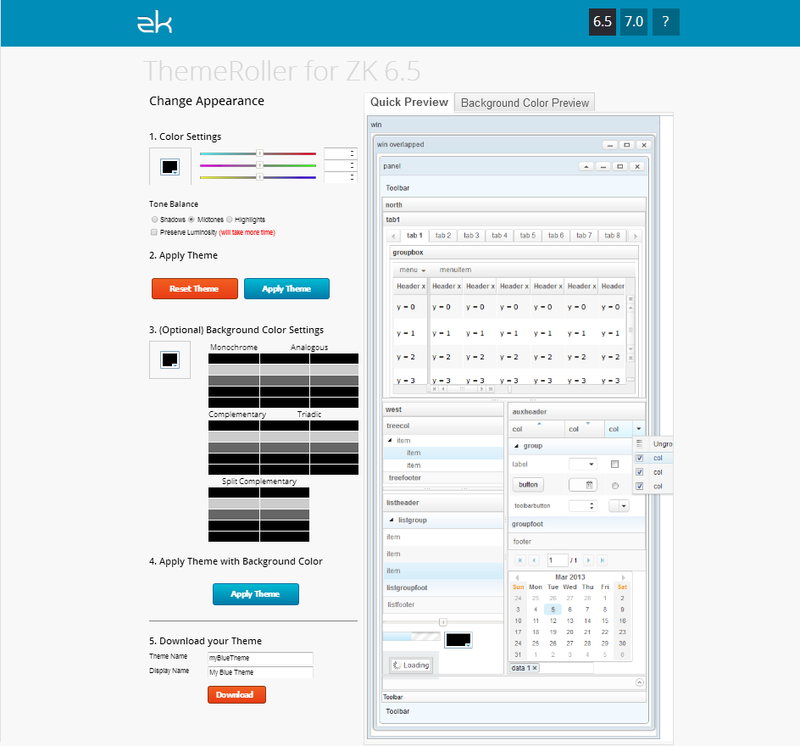 ZK Online Themer, also known as the ThemeRoller is an online ZK theme generator that helps you to do all that and generate different themes and colours for your ZK application in just a few clicks! 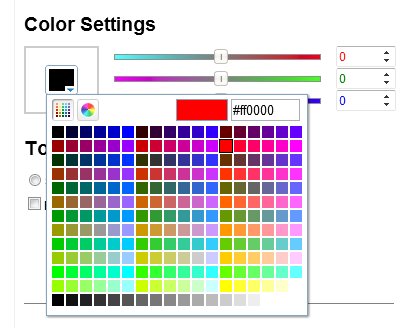 You can see how the colour would really look like on ZK components in the “Quick Preview” tab. ZK Themer is designed to base on the breeze theme to generate new sets of background images and CSS files, however, there are a lot of grey images that cannot be changed with basic colour because the saturation value of these grey images is zero so you’ll have to change the colour of these images by adjusting the colour balance like you would do in Photoshop. 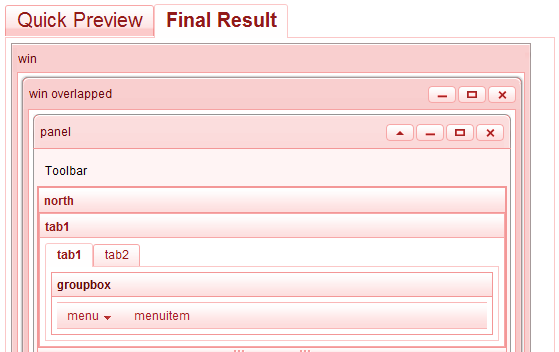 You can then see ZK components in “Final Result” tab being applied the new colour and theme of your choice. Once you have played around and found yourself a theme you like, you can download the theme as a jar library like ZK Themes to use and apply it to your application. Wow! The ZK demonstrates its power again. Congratulations to the Potix developers for another big difference. A generator of themes, it is a wonderful application, will improve the value of zk. Other frameworks like vaadin, have themes very captivating, but use less immediate. By providing themes, or giving the possibility to generate them easily, zk will have no rivals! Thanks for your comments, please feel free to leave your feedback here, we will evaluate the features accordingly. 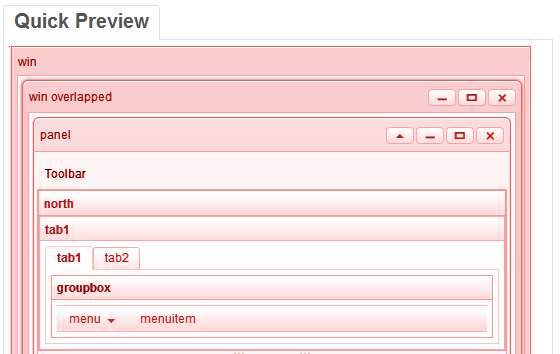 Hey, i included myOrange theme jar generated through this in the lib folder, but the theme is not getting applied. It is continuing with the same breezer default theme of zk6.5.. Can anybody figure this out? How i will use in my zk project? It don’t work…. how are? ZK Themer is currently in its alpha and for trial only. Supporting ZK 6.5 is on the list but we need to consider overall priorities. I will let you know if there is an update. What zk version are you using? After downloading the jar file, if i want to change color for particular component, how can i do that ? Why is everyone saying this is amazing? I’m a front-end web developer. I’ve been working with ZKoss for the past week and frankly styling it is a nightmare. All these “themes” seem to do – when I can figure out how to get them working – is change the font and background colors. Wow. That’s sooo amazing. 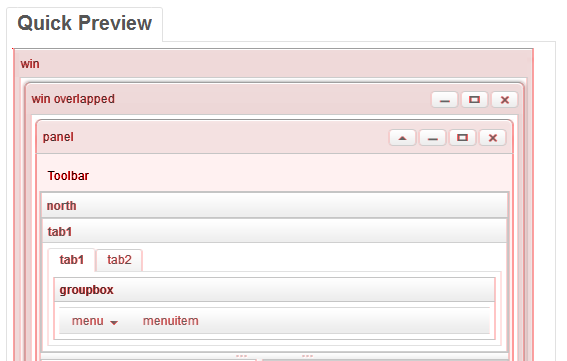 Seriously – ZKoss – stop using tabular layouts because they are extremely irritating to style. And don’t generate stylesheets. I’m having to override everything. Do you want to talk more about the exact problem you have? It nice, but not easy, the style guide are limeted, but it’s an excelent tool. I’m not a programmer in JAVA so I need to investigate many technisism. So this tool is really amazing, for programmers, and for everyone. Thanks for the theme generator, but what happened to the ‘loading spinner?’ When using one of these themes I no longer seem to have the nice spinner gif?